Tigers & Strawberries » Beans Out of Gas? Thanks to my potty-humor obsessed husband, some important research has come to my attention. Scientists in Venezuela have discovered a natural method to reduce the gas-producing effect of beans: fermentation. Two compounds in beans have been pinpointed for years as being the culprits for the vegetables’ near-legendary (at least in my family) capacity for creating intestinal gas: alpha-galactosidic compounds (a component of oligosaccharides in the beans) and soluble dietary fiber. These compounds are not digestible by humans, and so they pass directly to the large intestine, where they are broken down by naturally-occurring gut bacteria, such as lactobacillus. The side effect of this process is a great deal of stink-producing hydrogen and methane gas. Fermentation by lactobacillus bacteria, however, has been found to reduce the troublesome gas-producing compounds in beans–essentially, scientists are allowing lactobacillus bacteria to pre-digest the alpha-galactosidic compounds and soluble fiber -before- they are eaten by humans. This way, fewer of these compounds reach the lactobacillus bacteria in the gut, where they would be broken down and gas would be produced. This is great idea, which not only gets rid of the gas, but also renders the beans more nutritious to humans. More nitrogen is available to be digested in the lactobacillus-fermented beans than in those which are not fermented, and there is evidence that the proteins and starches in the beans are more readily digested in the fermented version. What I want to know is–what do the fermented beans taste like? The Scientific American articles are noteably reticent on that point, but as far as I am concerned, if the fermented beans don’t taste good, no one is going to eat them, even if if they produce less gas and are more nutritious. Lactobacillus fermentation, (also known as lactic acid fermentation) which is the process by which yogurt, kefir, sauerkraut, kimchee, sourdough bread and some pickled foods are made, creates a distinct difference in flavor and texture between the raw materials and the resulting fermented product. Cabbage and sauerkraut do not taste or feel the same. Cabbage is somewhat sweet, crisp-textured, and a bit biting, while saurkraut is sour (hence the name, huh? ), soft and somewhat squeaky in texture. (It squeaks against the teeth when you chew it.) Yogurt is tart and thick, while milk is thin and rather basic in flavor. Sourdough bread is noticeably acidic, while regular yeast-fermented bread is not. I don’t know if I approve of acidic beans. Then again, since I like every other product of lactic acid fermentation I have ever tried, especially kimchee, a dish at which many Westerners turn up their noses, I may be wrong. Tangy beans may be tasty. But, I think that -some- mention of the flavor should have been made. I mean, geez, scientists eat, too, and presumably they taste what they eat. Right? I know my brother-in-law who is studying genetics at Cal Tech certainly tastes his food–I know, because he talks about it a lot. The same goes for a certain organic chemist of my aquaintance. My point is–scientists are foodies too, so why don’t the researchers in question let us know the most important thing–how do those danged beans taste? I may have to do my own research project to find out. What does Zak, the originator of this post have to say about the issue? Actually, Japanese people have been eating fermented beans for a good while now. Natto is fermented soybeans. It looks and smells horrifying at first, so it’s more of an acquired taste (like fine cheeses), but very nutritious. You can probably find it in packages at Asian grocers. I forgot about natto–thank you for reminding me! I wonder, is it produced using lactic acid fermentation? I’ve never eaten it, but I have seen it–it looks pretty scary. Stinky tofu is fermented, too–and I like it….I forgot about it, too. while I know it doesn’t feature acidophilus, this reminded me of natto, too, which is surely an acquired taste… and I’ve just read some interesting facts about fermented foods in Native Amercian cultures, some of them being quite disgusting for a modern western person, but this stuff seemed to be quite nutritious. Beans/pulses seem to be one of the foods which don’t ‘want’ to be eaten – featuring growth inhibitors, so fermenting them to obtain a healthier protein should be a good idea, anyway. The Nepalese eat a fermeneted black bean called kinama. It and soybeans are fermented with lactic acid. I haven’t had the soybeans (allergies), but I adore fermented black beans, kidney beans, and puye beans. They are very strong flavored, and may take sime getting used to, but if you like sauerkraut and kimchee, you will probably like fermented beans. Noddy, now that I think on it, I eat salted fermented Chinese black soybeans as a flavoring ingredient all the damned time. On the other hand, I can’t imagine making refried beans out of them, either…. But yeah, I -do- like fermented black soybeans–I just forgot about them, like a big goober! 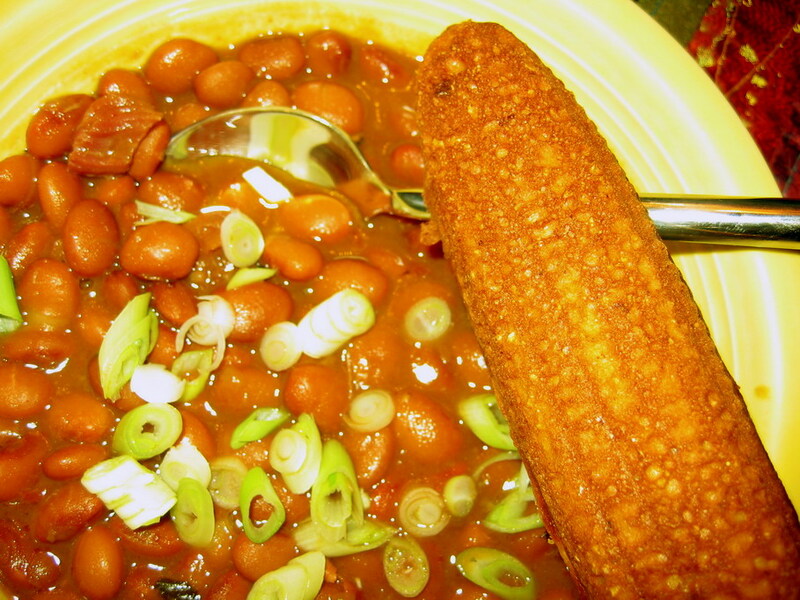 Foodfreak–I love all kinds of beans, really. Green beans were my favorite vegetable when I was growing up, so I hear ya! But, I still like by dried beans and lentils, too…. I still haven’t tried natto…. Can I go out and find lactic acid to try this “fermented bean” thing out myself, and is it safe to experement with fermentation if I know virtually nothing about it? News of gasless beans is like a miracle to me and my family. We LOVE beans and would eat them more often if it werent for the sometimes painful after dinner effects. It has been bittersweet as you can imagine! Taste variation depends wheather the beans are soaked as “fermentation” or are coked first and on the length fermented. It is common in Texas and Mexico to soak beans overnight prior to boiling. I have experimented with black beans soaking at room temperature and at 90F in humid Houston outdoor air in a loosly covered ceramic Mexican bean pot for 48 hours and then cooking, with no change in taste or texture. The asian “fermented beans” are different. Natto soybean is processed similarly. The asian fermented beans are definitely an aquired taste. I use whey strained from kefir, which contains both of the bacteria that study named (L. casei and L. plantarum), diluted 1:2 as an overnight room-temperature soak for beans already soaked eight hours in plain water to start the germination. I stumbled in here on a search of the web for instructions on fermenting beans. I have loved the stuff for years and it’s starting to show up on supermarket shelves now thanks to the growing Asian population. I have also been fermenting things like yogurt, sauerkraut, beer, wine, sourdough, cheese and kim-che for as many years. I suppose fermented products may be an :acquired” taste although I can’t remember ever not liking them. Fermented bean curd has a strong flavor. About the same magnitude as an anchovy in strength although a different flavor. There are a few dangers involved in fermenting, so I want to get some info from experts. I haven’t had any luck in the week or so that I have been surfing. I’ve tried many search strings and all I get are ads. Just throwing a guessed-at amount of lacto into some bean paste is not something I would recommend. Hopefully, someone who knows how will wander in and do us all a favor and post a recipe. Good site this one. Enjoyed the visit. I stumbled in here on a search of the web for instructions on fermenting beans. I have loved the stuff for years and it’s starting to show up on supermarket shelves now thanks to the growing Asian population. I have also been fermenting things like yogurt, sauerkraut, beer, wine, sourdough, cheese and kim-che for as many years. I suppose fermented products may be an “acquired” taste although I can’t remember ever not liking them. Fermented bean curd has a strong flavor. About the same magnitude as an anchovy in strength although a different flavor. I have no idea how to ferment soybeans, and have never seen instructions on how to do it in any of my over two hundred Chinese cookbooks. My guess is that it is a lactic acid fermentation process where you salt the cooked? beans–or maybe you salt the fresh beans–and press them down in a container and leave them for a few weeks to a month or so. But I don’t know. I can make sauerkraut, kimchi, mead, beer, wine and sourdough, but fermented beans–no clue. I am glad you liked the site–hope you come back.